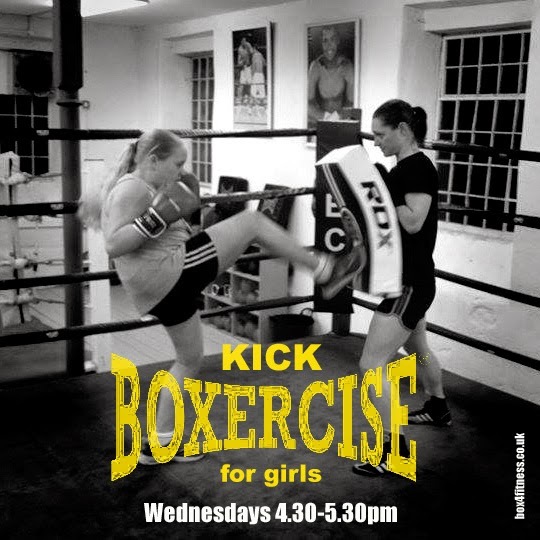 After the success of the self defence workshops we ran last half term and the feedback we got from the girls, we're starting a weekly Kickboxercise session just for 11-15 year olds. Wed 25 March 4.30pm we're running a taster session - open to all girls aged 11-15 years. The hour long session will take them through a warm-up, a few basics and give them a taste of hitting bags and kicking focus pads. Blocks of 8 or 12 sessions can be bought at discounted rates (£30 for 8, £40 for 12) or £5 per class. The initial taster session on Wed 25 March is free. Girls should be dressed in comfortable clothing that does not need adjusting once the gloves are on - a vest or t-shirt, shorts or tracksuit bottoms and CLEAN INDOOR FOOTWEAR (due to the nature of the training it is important that footwear is clean and for indoor use only), trainers or flat plimsolls - no high-tops. A warm sweatshirt or tracksuit top to warm up and cool down in and a bottle of water. We do not encourage anyone to drink anything but water in the gym so no fizzy pop, cordial or energy drinks please.